​The pantheon of Ancient Greece was a large one, and today many of the deities who make up the pantheon are all but forgotten. Some of the major gods, especially the Olympian deities, are still remembered, as is Prometheus, a non-Olympian god, but an important deity. In antiquity Prometheus was regarded as the “Benefactor of Man”, and is a title that is indicative of the work done by the god, and the esteem in which the god was held. The story of Prometheus in Greek mythology can be ascertained from the works of Hesiod (Theogony and Works & Days), but many writers in antiquity spoke of the Titan. Three works attributed to Aeschylus, Prometheus Bound, Prometheus Unbound and Prometheus the Fire-Bringer, told the tale of Prometheus, although only Prometheus Bound has survived into the modern day. The story of Prometheus begins in the time of the Titans, a period of time prior to the emergence of Zeus and the other Olympian gods, for Prometheus was a Titan god. Prometheus was the son of the first generation Titan Iapetus and the Oceanid Clymene, making Prometheus brother to Menoetius, Atlas and Epimetheus. 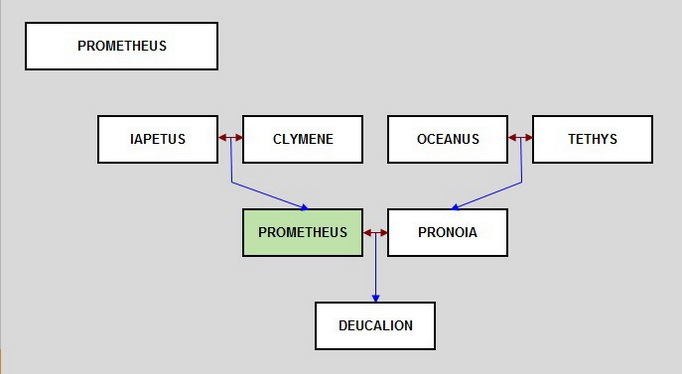 Each of the sons of Iapetus had their own special gift, and Prometheus’ name can be translated as “forethought”, conversely Epimetheus’ name means “afterthought”. Prometheus was born at a privileged time for the Titans, for the offspring of Ouranos and Gaia were in the ascendancy, as the Titan Cronus was the supreme deity of the cosmos. The rule of the Cronus and the other Titans would be challenged by Cronus’ own son Zeus. Zeus would lead an insurrection against the Titans, and gathered his allies upon Mount Olympus. The army of the Titans faced off against them from Mount Othrys. Now it might be assumed that as a Titan Prometheus would be amongst the Titan force, and certainly his father, Iapetus, and his brothers Atlas and Menoetius were. Prometheus though was said to have foreseen the outcome of the impending war, and so he and Epimetheus declined to fight with their kin. After ten years, the Titanomachy ended just as Prometheus had foreseen, with the Titans defeated and Zeus now the supreme deity of the cosmos. Zeus started to allocate responsibilities to the his allies, and although not necessarily his allies, Prometheus and Epimetheus were not punished like the other Titans, and were indeed given the important job of bringing life to the earth. 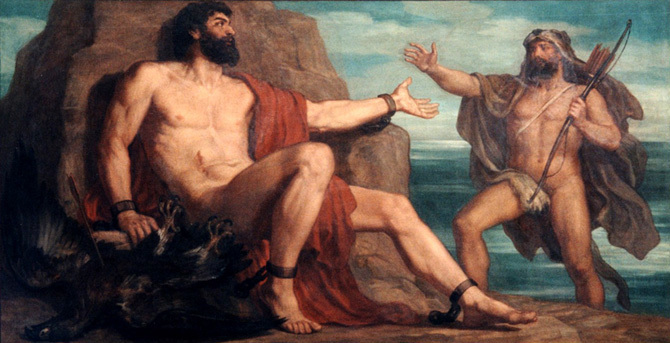 Prometheus and Epimetheus would craft animals and man out of clay, and then Zeus breathed life into the new creations. Prometheus and his brother were then tasked with giving the new creatures names, as well as attributing all the characteristics to the creatures that the other Greek gods and goddesses had manufactured. For some reason Epimetheus took charge of this task, but having only “afterthought”, Epimetheus used up all the characteristics provided before he got to man. Zeus would not allocate any more characteristics, but Prometheus would not simply leave his new creations unprotected and naked in a new world. Prometheus therefore went secretly through the workshops of the gods, and in the rooms of Athena he found both wisdom and reason, so he stole them, and allocated them to man. Prometheus knew very well that his actions would anger Zeus, and he had seen the punishments already meted out to his kin. Therefore to placate Zeus, Prometheus volunteered to teach man how they should make sacrifices to the gods. Prometheus though was already planning on how man could gain from this arrangement, and so the Sacrifice at Mecone took place. ​The Titan Prometheus showed man how a bull should be sacrificed to the gods. Prometheus had man divide up a prime bull, with the parts placed into two separate piles. One of the piles was made up of all the best meat from the bull, whilst the second pile contained the bones and skin. ​Prometheus though made the second pile look more appetising by covering it in fat. Zeus saw through the deception, but when asked which pile he wish to have as a sacrifice, the supreme god nevertheless chose the pile of skin and bones, leaving man with all the best meat. Subsequently, future sacrifices would always be the second best parts of the animal. Despite see through the trick and going along with it, Zeus was still angry, but rather than punishing Prometheus, Zeus decided to make man suffer instead; and so removed fire from man. Prometheus though continued to live up to his moniker of “benefactor of man”, for he was not about to let man suffer for his trickery. Once again Prometheus went amongst the workshops of the gods, and in the workshop of Hephaestus, took a fennel stalk that contained an ember of fire. Prometheus returned to earth and in Sicion the Titan showed man how to make and use fire, and with this knowledge now sown, man could never be deprived of fire again. Prometheus had already warned Epimetheus about accepting gifts from the gods, but Epimetheus was overjoyed about being presented with a beautiful woman to be his wife. Pandora brought with her a wedding gift, a chest (or jar), which Pandora had been told not to look inside. Of course Pandora’s curiosity eventually got the better of her, and once Pandora’s Box was open, all of the world’s ills were released, and man would suffer evermore because of it. With man now suitably punished, Zeus turned his ire against Prometheus. Prometheus had got away with much, but the final nail in his coffin, proved to be Prometheus’ refusal to tell Zeus the details of a prophecy about Zeus’ downfall. Zeus therefore condemned Prometheus to an eternal punishment, just as he had punished Prometheus’ brother Atlas. 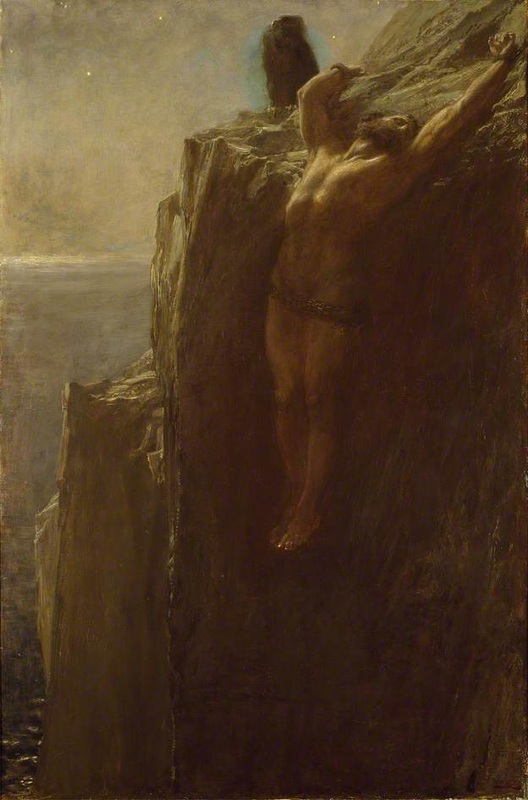 Prometheus was therefore chained to an unmovable rock deep in the Caucasus Mountains with unbreakable chains. ​This though was only part of the punishment, for each day an eagle, the Caucasian Eagle, would descend and pluck out the Titan’s liver before eating it in front of Prometheus; each night though the liver would regrow, and the attack of the eagle would reoccur. In the Caucasus Mountains, Io would see Prometheus. Io at the time was in the form of a heifer, having been found in flagrante with Zeus. Prometheus would advise Io on the direction she should take. Even more famously though, Prometheus was encountered by Heracles; Heracles needed the assistance of the Titan and so when the eagle descended to torment Prometheus, Heracles shot and killed the bird. Heracles then released Prometheus from his chains. Heracles avoided the anger of Zeus though, for the Greek hero was the god’s favourite son. Prometheus even agreed to provide the details about the prophecy that had got him bound in the first place, telling Zeus that the son of Thetis would become more powerful than his father. This prompted Zeus to stop chasing Thetis, who was then married off to Peleus. At one point Prometheus would partner with Pronoia, the Oceanid nymph of Mount Parnassos. This union would bring forth one son Deucalion. Just like his father Deucalion would have his own title, for he was named “Saviour of Man”. Prometheus knew that the Deluge was imminent, and so before Zeus sent forth the flood water, Prometheus instructed his son to build a boat. In this boat Deucalion and his wife Pyrrha (the daughter of Epimetheus and Pandora), would see out the Great Flood safely, and the pair would then set about repopulating the world.